I absolutely love bamboo. Just the sound it makes when a soft breeze rattles the leaves is like music. I wish we had some growing in our yard. There’s something exotic about it too. Although it looks a bit more like a tree, it’s actually a grass. A grass that can grow up to 120 feet tall. 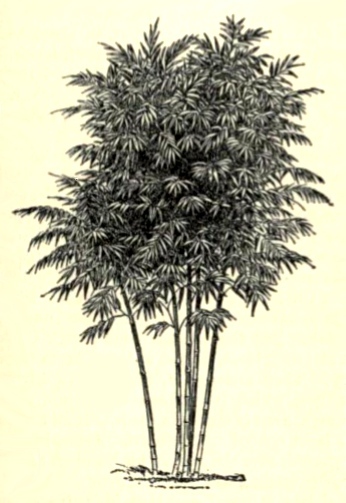 According to the 1910 Encyclopedia Britannica entry for bamboo that featured this bamboo plant drawing, bamboo produces grains that are edible. And, of course, there’s the yummy young shoots that are used in a number of Asian recipes. Some bamboo species even flower and product an apple-sized fruit. The ‘wood’ stalks are now being used as a sustainable wood source to make beautiful furniture and flooring. This bamboo plant drawing would make a great addition to a project that needs a bit of Oriental feel or a tall background image.